For all of you with Photo Booth on your Macs, you understand how it provides hours of entertainment–playing with effects, contorting your face into the weirdest expressions possible and then laughing with your friends and family about the hundreds of photos on your computer of you looking like a cyclops, Jay Leno or both. I first experienced the narcissistic joys of Photo Booth a few years ago playing around with my aunt’s MacBook, then again when my sister got one. And since I got my MacBook a few weeks ago, I’ve been playing with it almost daily. Then last night, Evan joined in on the fun. I wish I had some cute smiley photos to show, but most of them are of us making faces or just being generally ridiculous. Also, I believe this is new with Leopard, since I don’t remember seeing it before–you can take a series of 4 photos in close-to-photobooth style. They show up in a 2×2 configuration instead of a 1×4 and they actually save as individual photos, so I had to put these four back together in Photoshop, but I like them–they seem to tell a little story. 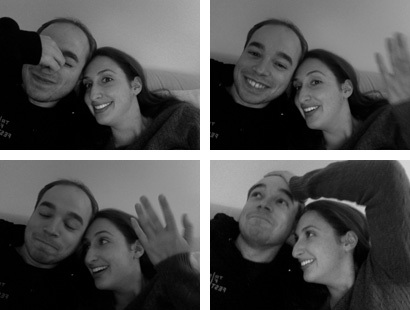 Oh, and Photo Booth takes mirror-image photos. I should have flipped them. Ignore the backwards writing on Evan’s shirt.